3 A 1 2nd fretfr. 2 D 2 3rd fretfr. optionalopt. 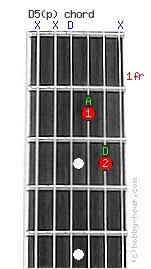 D5 power chord's notes: D, A and D. Only the 4th, 3rd and 2nd strings can be played. The note D on string two is optional. The string 4 (D) is left open. The D5 power chord is really a dyad or interval, as it has only 2 notes - the root (D) and the 5th (A). It does not have a 3rd, so it has no major or minor tonality. D5 (perfect fifth interval) power chord's alternative names: D(no 3rd), D(no3).